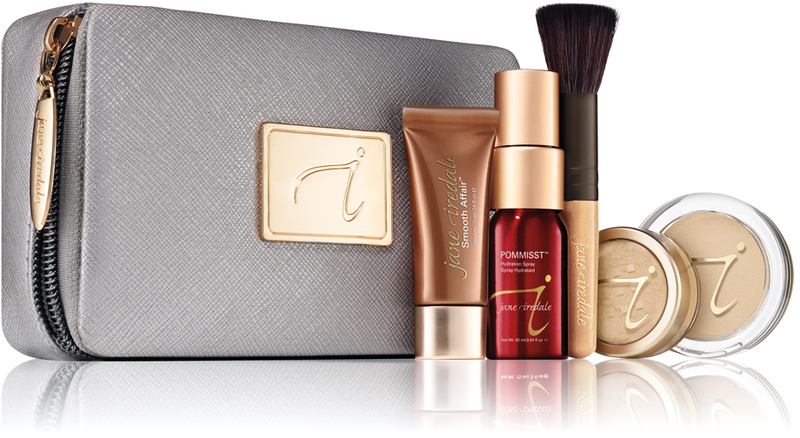 jane iredale Starter Kit includes Smooth Affair Facial Primer, multi-tasking Amazing Base Loose Powder and PurePressed Base Pressed Powder, POMMISST Hydration Spray and a mini Powder Brush for application. Available in four shades: Light, Medium Light, Medium and Medium Dark. This is a fantastic way to become familiar with Jane Iredale mineral makeup. I was particularly interested in the foundations and you get to try both the pressed powder and the loose mineral powder with good sized samples. I really was impressed with the generosity of the sample size - more than sufficient to really try the products. I was fortunate that the specific shade I thought I needed was available and it matched beautifully. Jane Iredale has an amazing range of colours available but this Starter Kit is limited to five. It would still be possible to work out which specific colour you wanted though, if you didn't get a perfect match. I really liked the makeup case that it was all packaged in and it was perfect for me to take on holiday. I wasn't originally convinced that the misting spray was necessary but after using the generous spray bottle in the kit I decided that it was worth investing in. My only problem with the Jane Iredale makeup was the cost, which does seem to be fairly high, however it lasts well so that long term it is an investment. The Pure Pressed Base comes in a gorgeous case which is refillable if you decided to purchase the full sized product. It really is an excellent way to try these products. Anyone who would like to know more about Jane Iredale's mineral makeup.